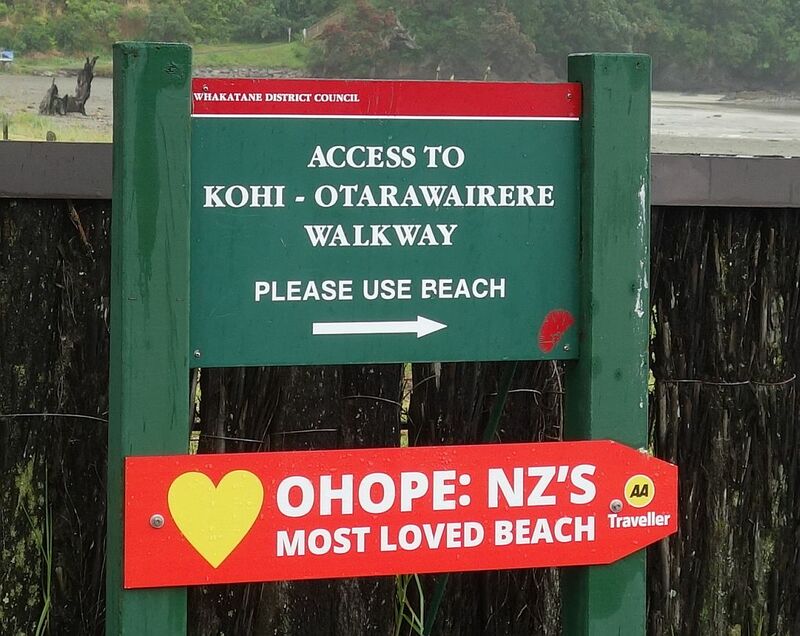 There are parking areas near both ends of the walkway, with toilet facilities near each end and also at Otarawairere Bay. Being a weekday walk, and with far from ideal weather, no other walkers were seen during the whole walk of almost 3 hours. Most of the walkway has tree cover, which provides shade, but also blocks the views. But there are viewing points along the way. 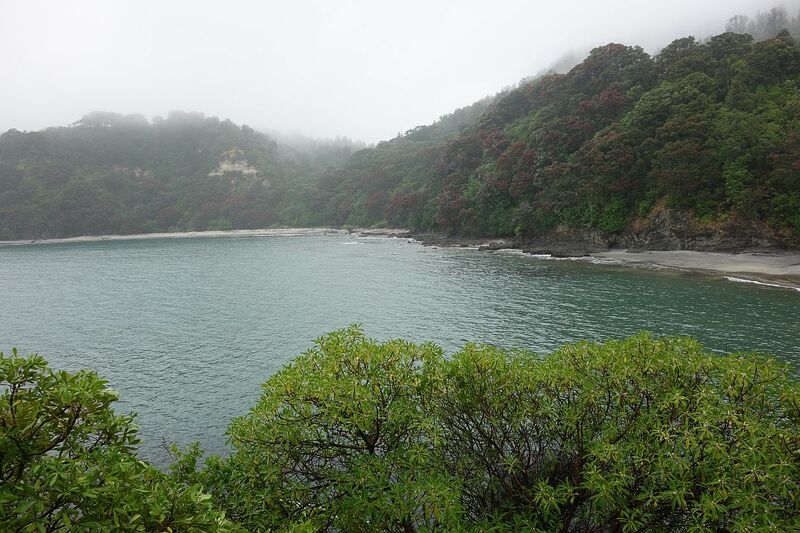 The track is well formed,, except for the walk along Otarawairere Bay, with wooden steps on the steeper parts of the walkway. 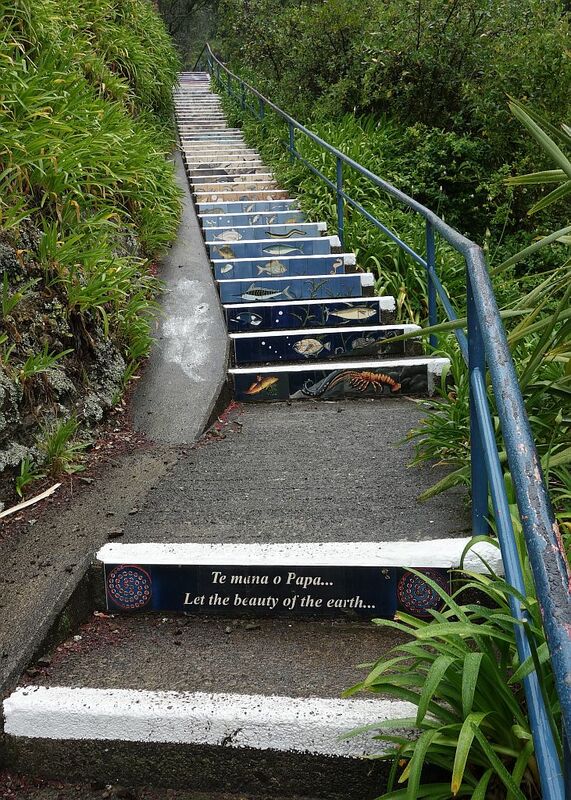 Starting from “The Rock” (Pohaturoa Rock) in the centre of Whakatane, the first part of the track consists of a stairway to Seaview Road, where the walkway itself starts. On the stairway there are 43 horizontal panels of glazed tiles on the step risers. Claimed to be the world’s first vertigraph. 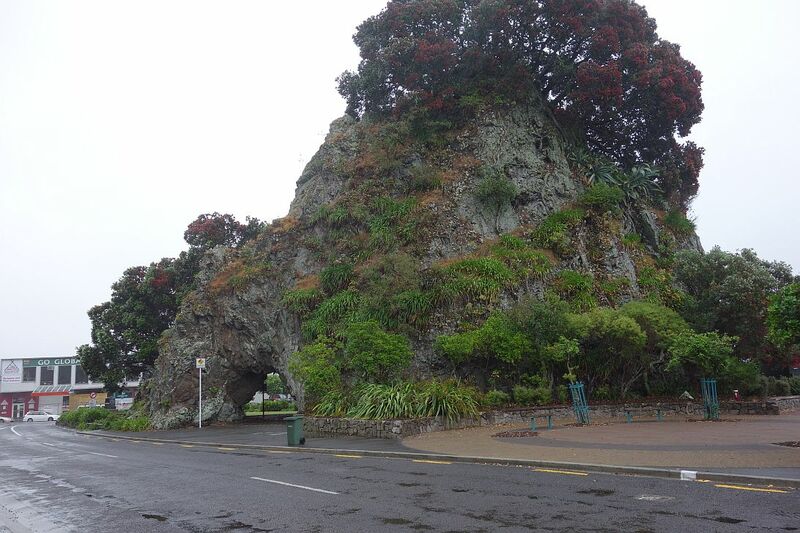 The well-known and often photographed Pohaturoa Rock in the centre of Whakatane township. There is a large hole through the rock, on the left of the photo. 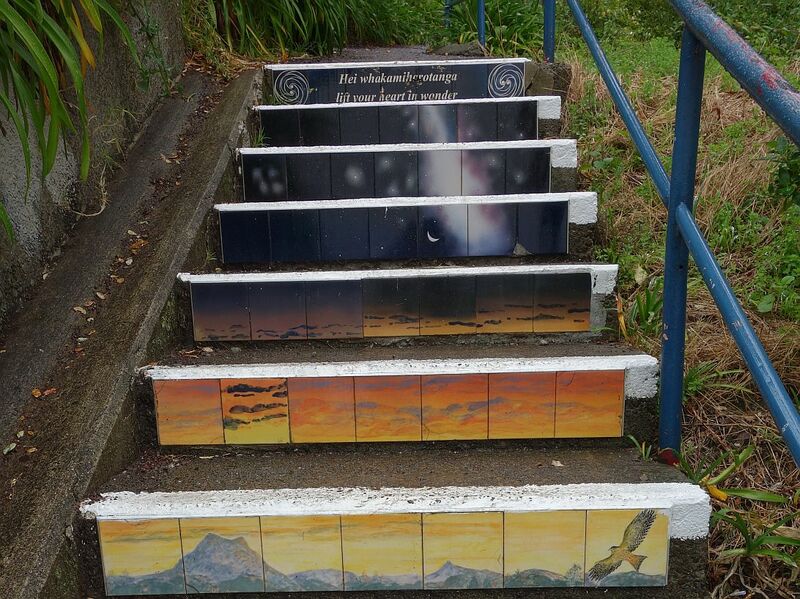 The stairway to Seaview Rd starts just across the road from the rock. The lower end and the top end of the vertigraph. 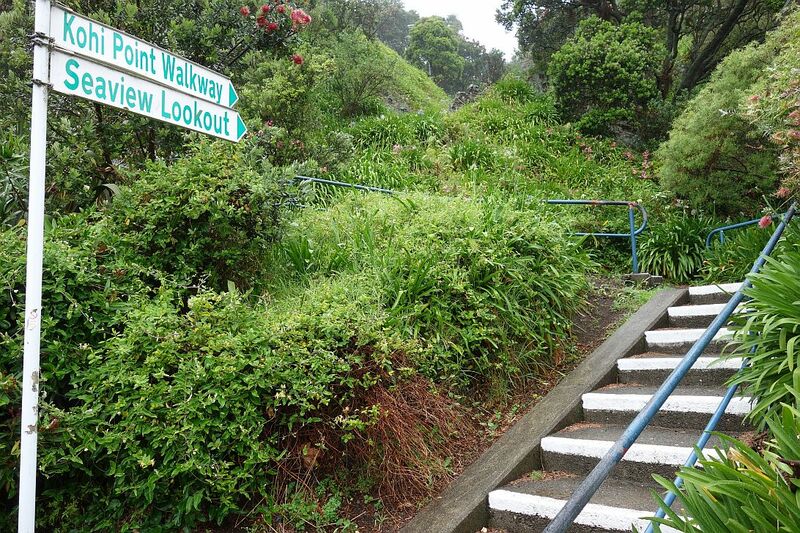 At the top of the stairs there is a short side track to Papaka Redoubt Historic Reserve. 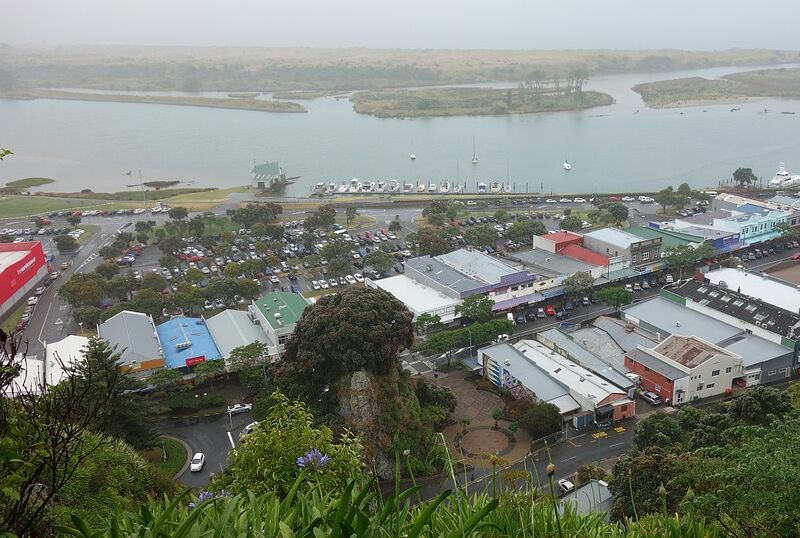 The views over the town and the Whakatane River from the reserve are impressive. On a fine, clear day. 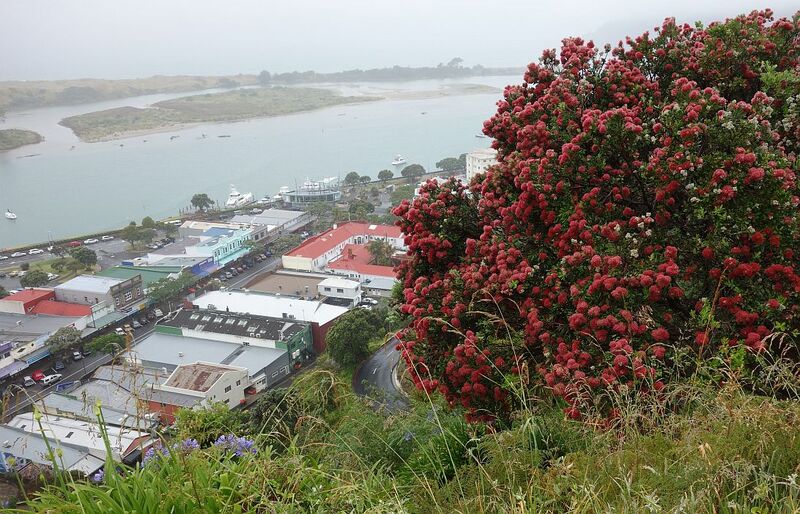 At the corner of Hillcrest Rd and Seaview Rd there is a pa site on Puketapu, with a lookout, Here looking to the north over the town, towards the river mouth. 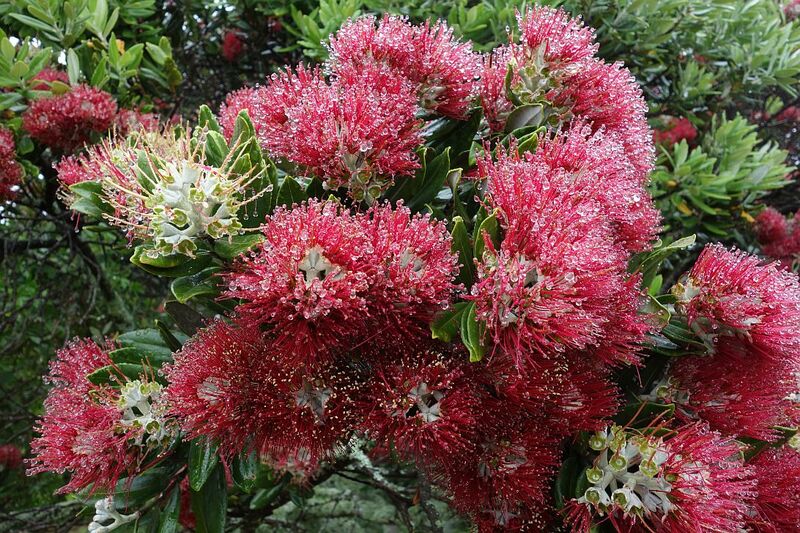 The pohutukawa (NZ Christmas tree) was flowering, and trees with flowers could be seen along a large part of the walkway. Near the track, in the middle of nowhere, there was an ornate lamppost with a lamp. 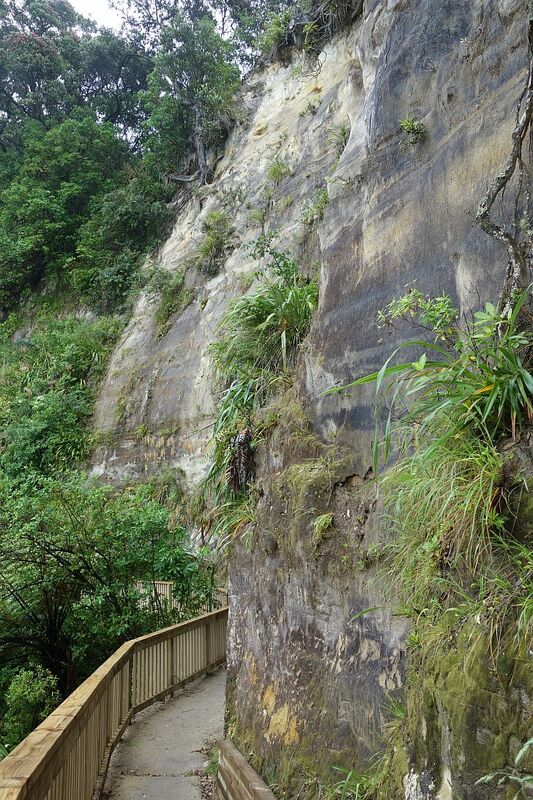 The lamp was installed to light up Wairere Falls just below it. However, the waterfall itself is not visible from the walkway. 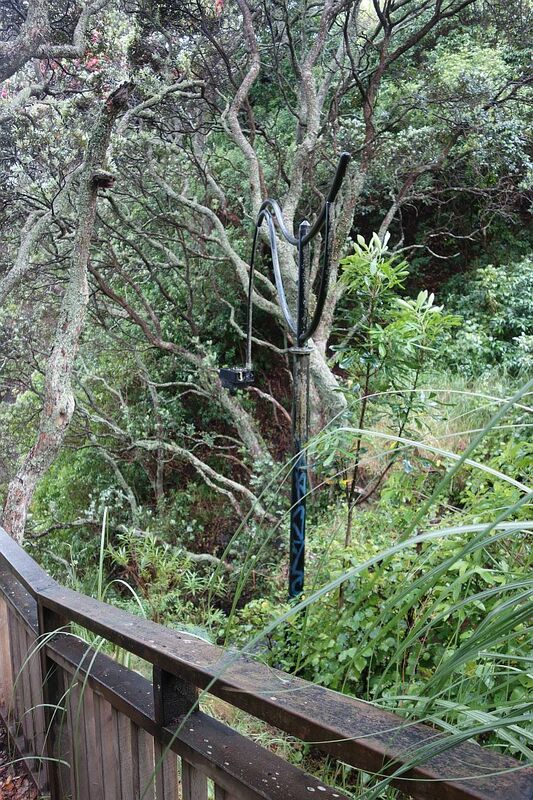 The Kohi Point Lookout is accessible up a short side track from the walkway. Unfortunately there was no view from here due to low cloud. On a fine day there are extensive views. The trig station marks the highest point at 183m asl. 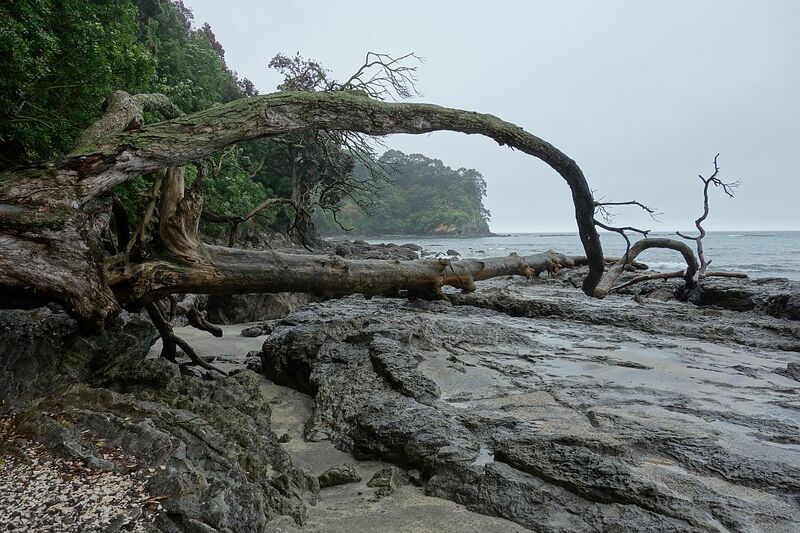 The location is also known as Kapu-te-Rangi, or Toi’s Pa. 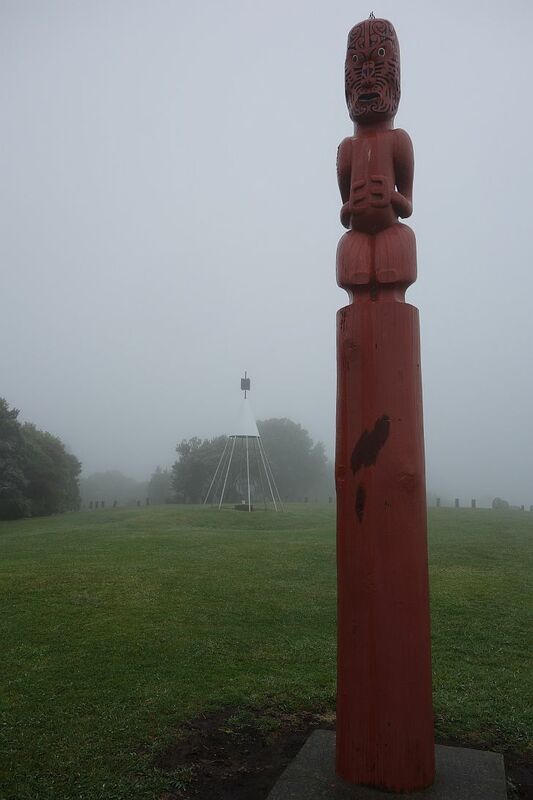 The carving represents Toi, a Maori chief. Near the northernmost point of the walkway it was possible to see the Pacific Ocean below. This was a suitable spot to enjoy a short lunch break. 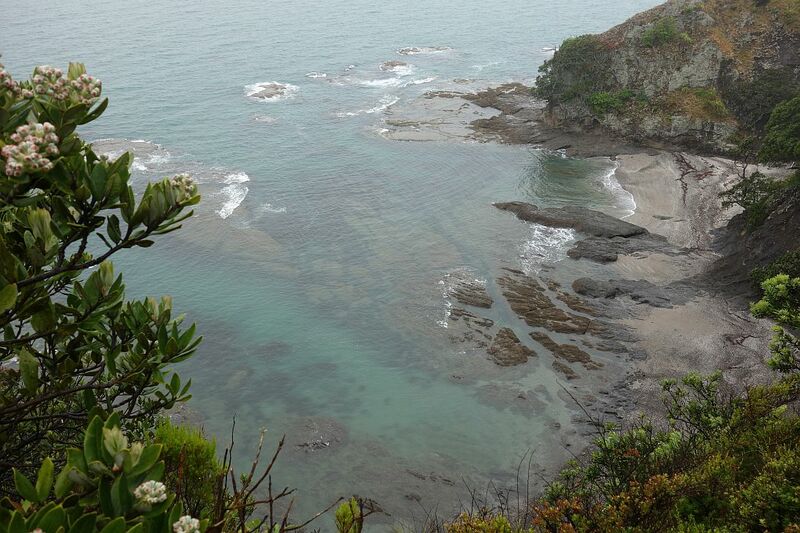 Looking down over Otarawairere Bay. The walkway continues at sea level along the bay. There are rocky outcrops to cross in various places. From the beach there is a side track to the suburb of Otarawairere. 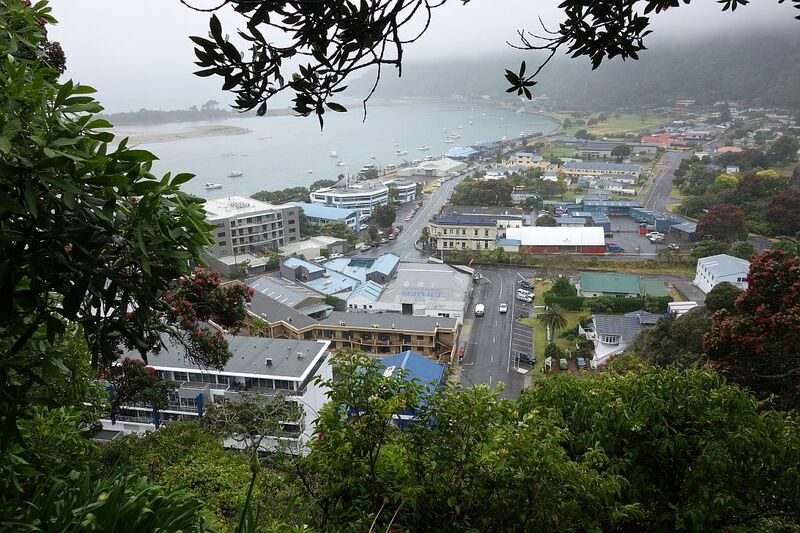 This suburb was created in the late 1950’s when the pulp and paper mill at Kawerau was bought by an American company. The company management needed new houses of a size and quality seldom seen in New Zealand at that time. The suburb is still one of the most expensive and prestigious in Whakatane. From Otarawairere Bay the walkway ascends again before approaching Ohope Beach. 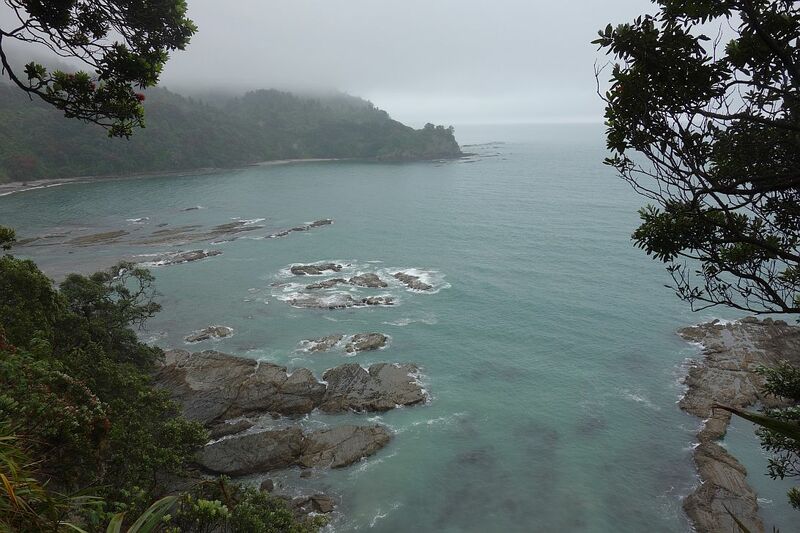 Here looking back over Otarawairere Bay. 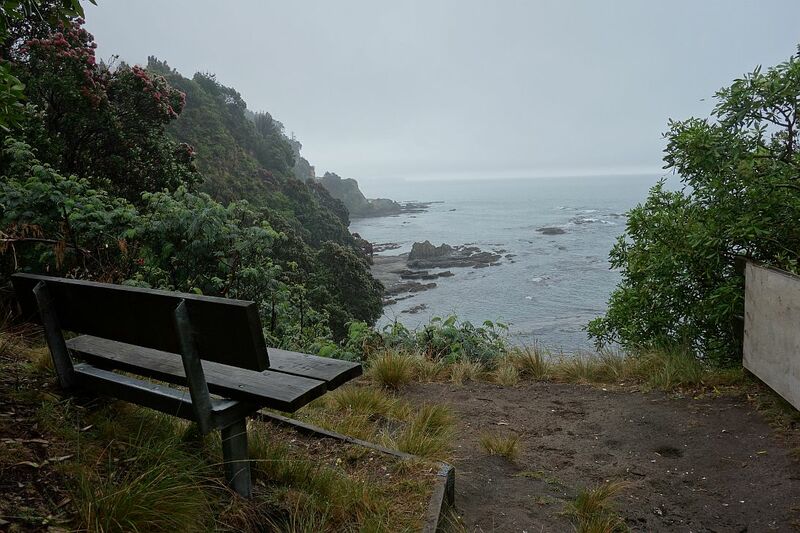 The view from the walkway to the west end of Ohope Beach. 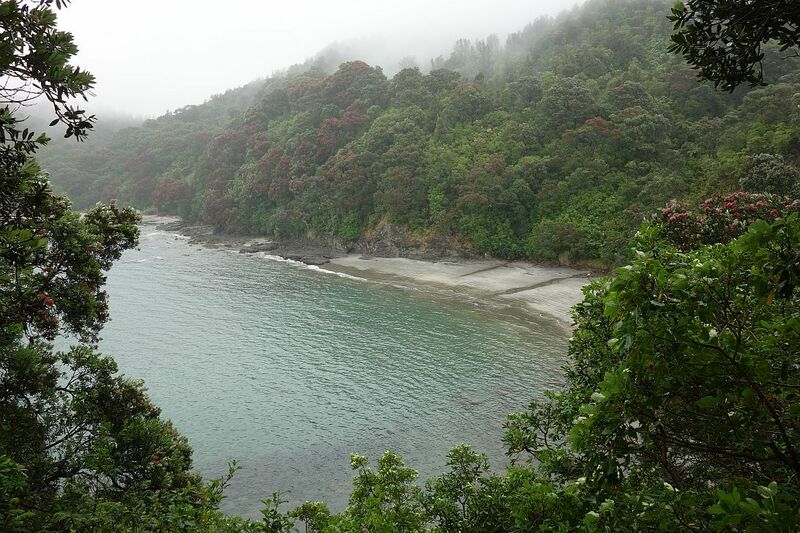 Between Otarawairere Bay and Ohope Beach the track runs along a hillside which is prone to slips during heavy rain. New guard rails and barriers are currently being installed along the track. 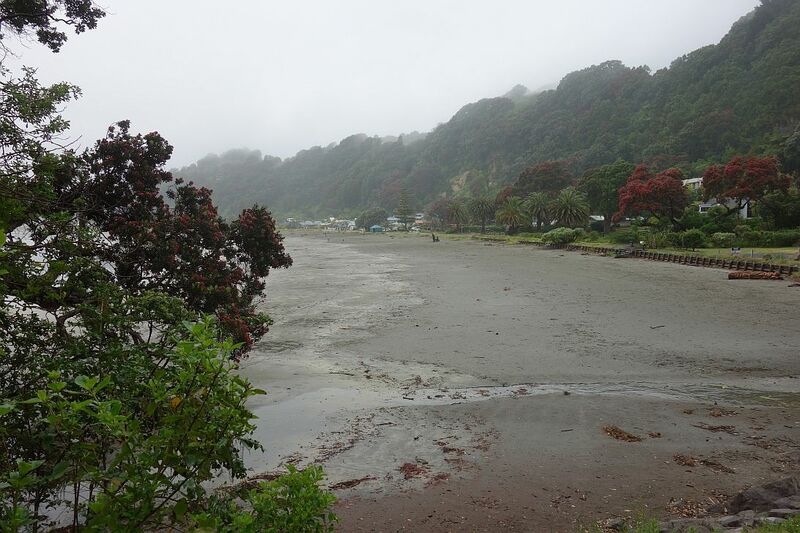 Approaching sea level again at the west end of Ohope Beach. 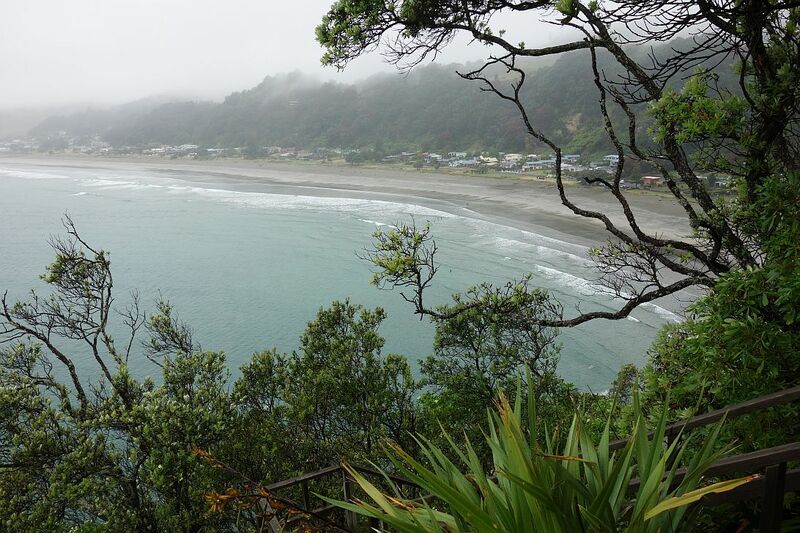 Ohope Beach was recently voted the most loved beach in New Zealand. 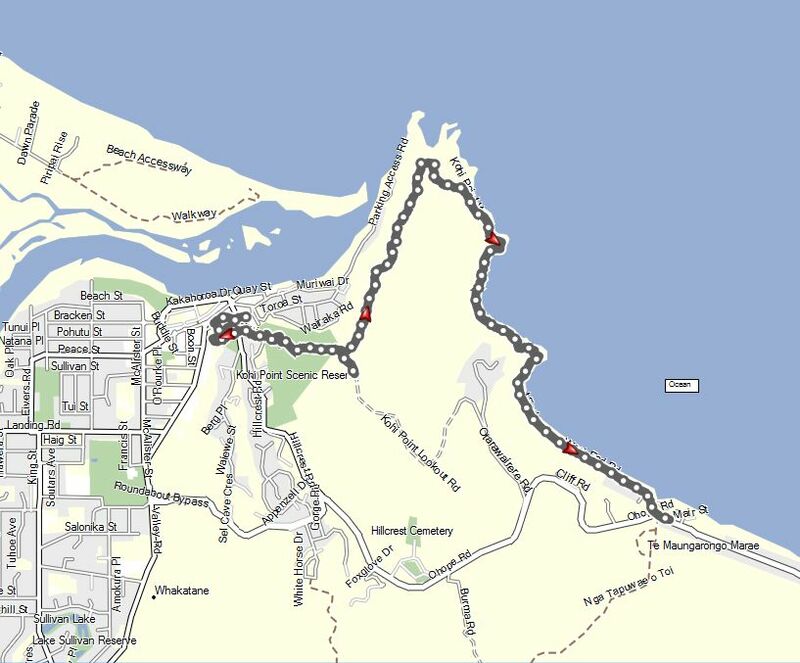 A GPS track log showing the pathway. Fortunately a very kind estate agent offered me a ride back to Whakatane. Thanks to Chris from Ohope Beach Realty. There is a bus route between Ohope and Whakatane, but there was a 1-hour wait until the next bus. This walk is definitely one which will be repeated on a fine day with clear visibility.